This Naturally Nice arrangement is exactly that and pretty, too! 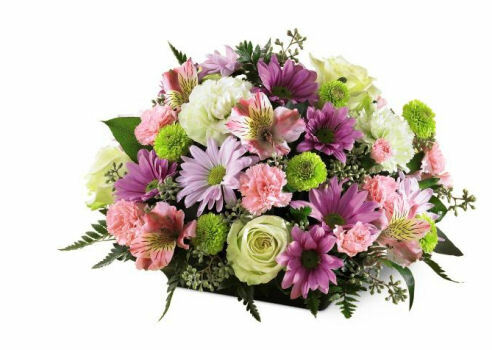 A beautiful mix of pale and dark lavender daisy poms, pink mini carnations and alstroemeria mix nicely with the soft greens of button poms, pistachio carnations and lovely jade or white roses. Assorted greenery adds the aura of a natural garden. Everyone will love this sweet design.